Under the shade of a mango tree, dozens of women gather to learn about preparing healthy meals for the children in their care. Some are orphaned. All have suffered hardship that has left them vulnerable in so many ways, including malnutrition. 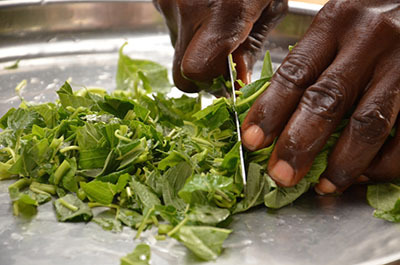 "Some of the ingredients you need to prepare a nutritious meal are not expensive," says Brenda Foga. She was preparing boiled yams and vegetables during a community cooking demonstration in Adikpo-Kwande, Nigeria. "You can use vegetables from your garden. They are good for the growth and development of children." Brenda is a nutrition manager for the Kejie Health Foundation, which specializes in child nutrition and receives support from Catholic Relief Services. This collaboration is a part of a 5-year national project designed by CRS that will eventually reach 500,000 orphans and vulnerable children, and the 125,000 caregivers who look after them. With support from the U.S. Agency for International Development and private resources, CRS has already supported more than 93,200 vulnerable children and 25,700 caregivers. "Teaching people to use what they already have is an essential way to support families," says Brenda. For people who don't have a farm or whose harvest was poor, Kejie Health Foundation operates a food bank, sourced from the foundation's farm, for the most vulnerable in the community. "When my children wake up, they need to be fed. When they come home from school and before they go to bed, they need to be fed," says Christana Orngu, who lost her husband 5 years ago. "I try to do what I must … but feeding is a challenge." 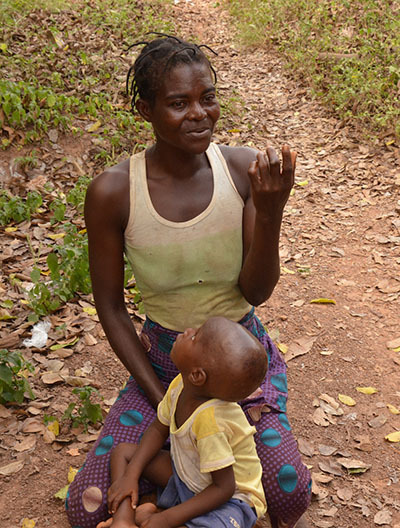 Christiana's son, Cletus, was severely malnourished for the first several years of his life. He didn't walk until he was 4 years old. Today, Christiana says, "The support and training I receive from [Kejie Health Foundation] helped my son walk." "Nutrition, although critical, is not a silver bullet for caregivers, orphans and vulnerable children," says CRS' Sasha Angelevski, who oversees the SMILE program—short for Sustainable Mechanisms for Improving Livelihoods and Household Empowerment—in Nigeria. "It's one piece of the puzzle." Another piece is education. 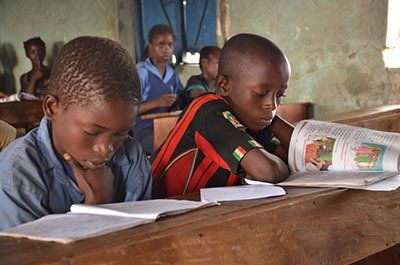 For too many children in Nigeria, going to school can be an unreachable prize. To address this, CRS and our local partners are mobilizing volunteer teachers at community schools that are free for students, unlike government schools which charge a fee that many families cannot afford. "This is my community, and I want to educate my brothers and sisters," says Jacob Vembre, a community teacher who volunteers his time to support orphans and vulnerable children. In other districts, CRS has worked with local government officials to have school fees waived for the most vulnerable students. "Education is the bedrock of everything. Education is life," says Gabriel Ukula, a staff member at Integrated Health Program, a CRS partner specializing in education. An essential aspect of this program is that it leverages local resources to ensure sustainability. Families take responsibility for their children, helped not by outsiders but by local organizations, government representatives, and members of the community who share their knowledge, skills and resources. CRS' approach is to help strengthen this network of support, so local people and organizations will provide comprehensive services to orphans and vulnerable children long after the CRS project is complete. Coordination and collaboration, including community-level partnerships and state and local leadership, are critical. Without this type of support, any shock to the system—a poor harvest, family crisis or unexpected expense—can force parents and guardians to pull children from school to help with household chores or work to provide family income. "This isn't a handout," says Sunday Udom, senior program manager for CRS in Nigeria. "It's a helping hand."